The Elms was first known as Maundies, later Elm Lodge. It is now the site of three houses and two bungalows - numbers 69, 73, 73A, 75 & 77, High Street, Hampton. altered. 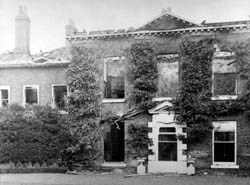 The house was burnt down by suffragettes in 1913. Early 17c Henry and Anne Palmer at Maundies.